During the month of April, we attended an Italian Piedmont Wine tasting at our favorite Wine Bar and Bistro in our area. I was not familiar with Piedmont wines so I was looking forward to a new wine experience. As usual Chef Kevin did a great job with the cuisine and the wines were pretty good. So good in fact, that I bought a few bottles and plan on sharing a few in future blogs! The first wine served was called Broglia La Meirana, Gavi del Comune di Gavi. 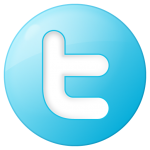 I really enjoyed the wine white and it was different from other whites I have had in the past. The grape varietal was Cortese. Cortese is an Italian grape variety most famously used in the production of crisp, lime-scented wines of Gavi. The variety is known for its bracingly high acidity and its ability to retain freshness, even when grown in hot environments. Apple, peach and honeydew flavors are commonly associated with this wine, with lime, almond, and light herbal or grassy aromas. Gavi is a comune in the Province of Alessandria in the Italian region Piedmont, located about 100 km southeast of Turin and about 30 km southeast of Alessandria. Gavi is in down in the lower right part of the Piedmont region. The following weekend a local Wine and Spirits store hosted a wine and cheese tasting. There were fifteen tables with five wines to be tasted. There was no way we could taste all of them so I reviewed the wine list and targeted some that I had not tried before. 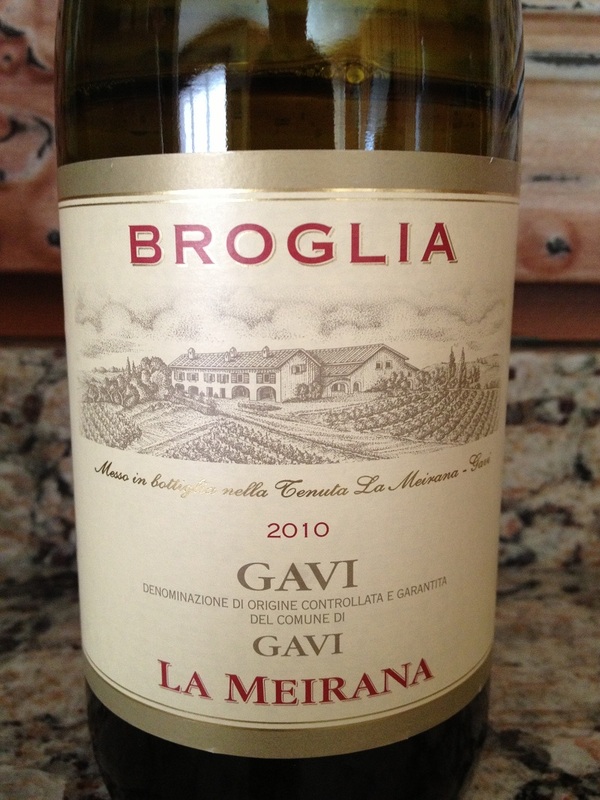 While reviewing the list I noticed they had the Broglia La Meirana from Gavi. I decided this would be the first wine to retry and the price was right! We bought a couple of bottles to have at home. The other day we had the kids over for a barbecue on a weekend that Nick and Bri were cleaning the aquariums; each year they clean them in the spring and in the fall. We pay them very well and Chris and I get out of doing it. I do help some by cleaning the filters in the larger 185-gallon aquarium. Sunday was the first day we hit 80 degrees for 2013. The weather had not been forecast for such a hot day, but we will take it! By 3:00pm, it was pretty warm so we started happy hour a few hours early. It was the weekend after all. I wanted something light and refreshing since I would be working inside and out and knew right away I wanted to have a glass of the 2010 Broglia La Meirana. Before I started helping Nick and Bri on the basement aquarium, I decided to take a few notes on the Broglia La Meirana wine. The Gavi white was opaque with a golden hue. The white wine was very clear. The Gavi white wine was very aromatic and fruity. I could smell, pears, green apple, and citrus fruit. I thought the wine was a little sweet with my initial tasting, but it was refreshing. The acidity was very good and lively and I could not taste or identify and tannins. Sipping the wine further, it was very soft and velvety with a silky and buttery finish. I could not identify and prominent fruit. Maybe Melon. The finish was long and flavorful. How much? I paid $16.00 for the bottle. 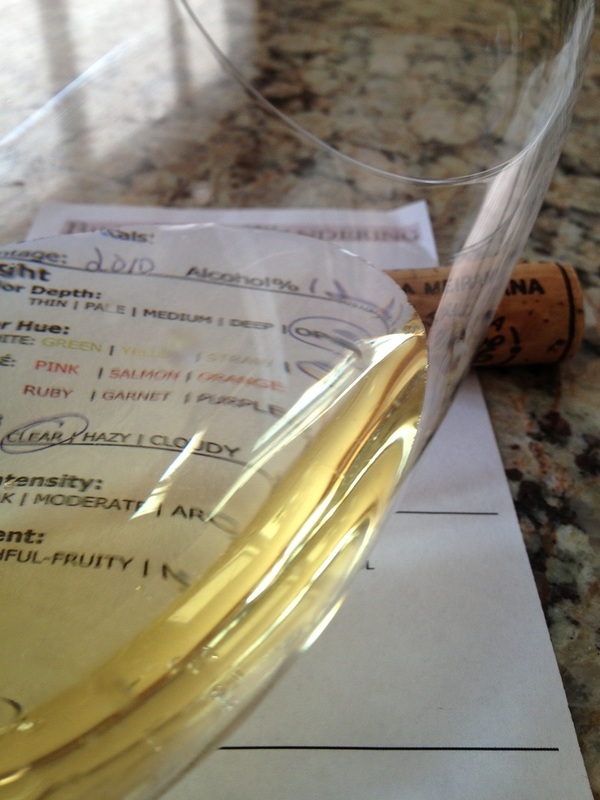 I rated the 2010 Broglia La Meirana three glasses. I am happy to have discovered this white wine from the Piedmont area of Italy. I’m also looking forward to drinking the Barolo’s I bought at the wine tasting a few weeks ago!